Cruising through Kings Langley past the modern residential homes overlooking the canal it`s hard to imagine the activity many years ago. Scenes like the one to the right of working boats un-loading coal onto what was once a very busy wharf. The biggest clue has thankfully been retained but from the canal is completely hidden. It is the Art Deco facade of the Ovaltine building I have pictured below. Ovaltine, a drink made up of Barley Malt, egg, cocoa and milk, has been in the UK since 1909. Now sold in over 50 countries worldwide it came here to Kings Langley in 1913. 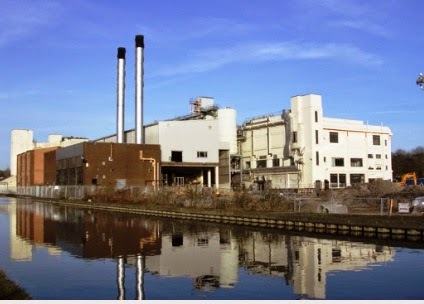 In 2002 production was transferred to Switzerland and the site was cleared making way for 300 houses and flats. I say the site was cleared but in fact the art deco front of the building was listed and had to remain. Two local farms, totaling about 460 acres, were purchased in the 1920`s. It became Ovaltine Farm producing barley, eggs and milk from it`s award winning herd of Jersey cows. Around 50,000 pullets laid the eggs. 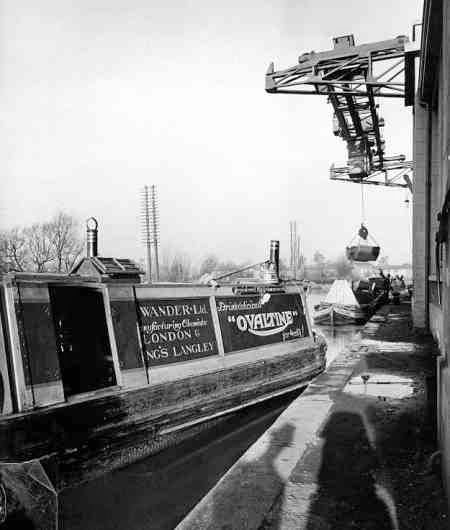 Ovaltine had it`s own fleet of boats that brought coal from the Warwickshire coalfields to power the factory. Eventually oil replaced coal and the only boats left are like this one I pictured on the Thames. 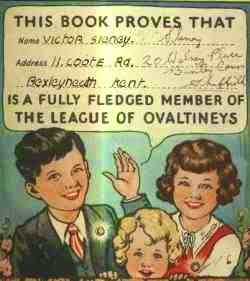 In 1935 the club called `the Ovaltineys` started. It was a childrens club and had in 1939 five million members. All members had 7 rules. I promise to do the things my parents tell me to-because they know what`s best for me and i want them to be proud of me. There were secret signs and signals as well as a very secret password......ok but just for you and do not divulge it "Ovaltiney-Ovaltiney". Now I`m bound to get kicked out of the club. 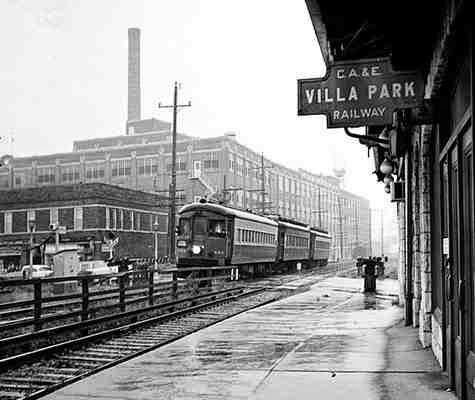 In 1915 production of Ovaltine started in Villa Park Illinois USA. 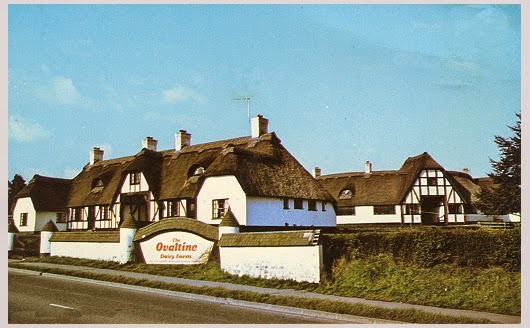 Production ceased in 1988 and at present Nestle have the Ovaltine US rights. 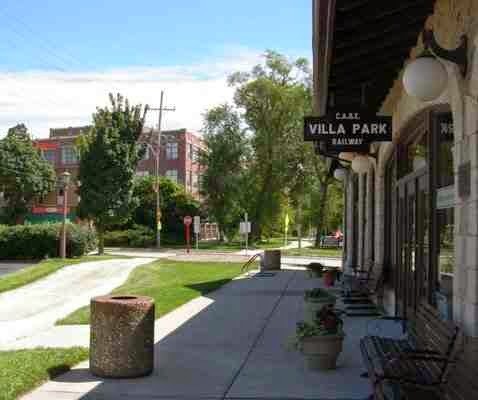 The building was used by homeless people until in 1997 it was sold and converted to apartments that were completed in 2003. The picture with the factory in the background on the right is dated about 1955. Over on the right is the present day view at Villa Park. As in the case of the UK site the building has been converted into apartments. A 2 bed can be rented for around $1600 about £987 per month. If you decide to rent here you might have some haunting experiences included in the rent. The Ovaltine building at Kings Langley during demolition. 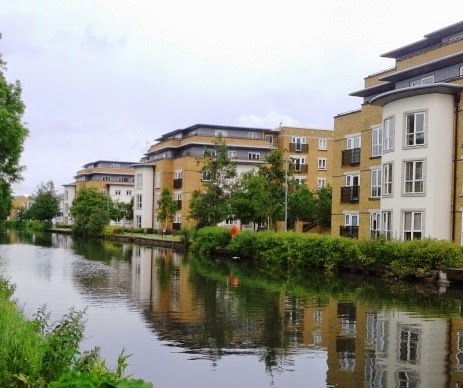 The present day view (below left) and the site now contains 300 flats and houses.Now one of the top floor " bed flats pictured above is for sale at £340,000 - $550,000. On the sales page is a mortgage calculator and if you tap in £340k minus 10% deposit = 306k at 5% interest over 25 years the payment comes up as £1788-$2,914 per month. The same purchase figures in the U.S. I find confusing as they quote fees I have no knowledge of. UK readers take note the rate remains fixed for the length of the mortgage unlike here when just a half % rise in the bank rate can push payments up by almost £100-$162 per month. When you look back at past rates here in the UK it is frightening to imagine what could happen. Egg farm lower right. Factory next to tall chimney. Canal can be seen coming in to left of chimney. View to the rear of factory backing on to canal. Two pairs of boats can be seen. I just love the old/new past/present pictures. The two below are © Hugh Mcknight. Same view in 2014. Above and below this lock have been very peaceful moorings during the many hospital visits. Not sure of the date above but the Metropolitan railway arrived in 1927 so at least pre that date. Interesting thing about the railway is that it is about to be diverted into Watford town centre. When built the Met was intended to go into the town but objections halted it in it`s tracks and it has taken 80+ years to get there by a different route. The original building that the train company purchased still stands in the high street and is a pub. London Transport sold the site in 1936. Same view in 2014, the Met railway bridge has recently been renovated. We moored here for a few days when I had my last surgery. It was nice to be near fuel and water at the marina and the bridge I am taking the picture from has a bus service into town. As things turned out our stay was short and we moved up into the park with just trees for company. 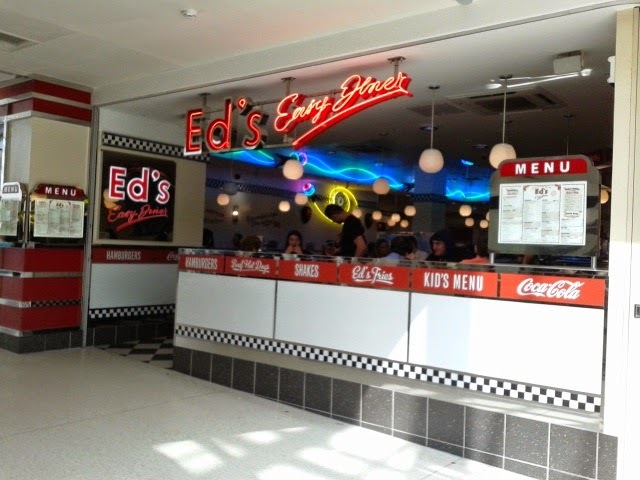 Ed`s easy diner in Watford was a draw for Jaq as they sold genuine A&W Root beer. I decided on the coffee with it`s free endless refills. With 1950`s and sixties rock n roll playing Jaq drifted back to her childhood in Alaska and the Bun Drive-In. When I was a very little girl my sisters, who were ten and fourteen years older, used to babysit me while our mom worked nights cleaning planes at the airport. When it was my sister Susan's turn to watch me, she would take me out with her to some of the hot teenage night spots. The Bun Drive in on Northern Lights Blvd. 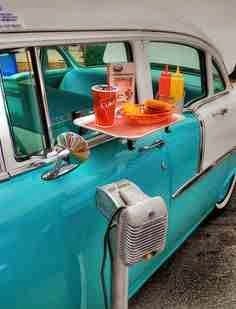 was a classic 1950's American Drive in Restaurant. One could pull up and park and a car hop (waitress) would come out and take your order and then deliver it to the car when it was ready. The tray hung on the window. Susan and I always went inside and I sat at the circular bar to eat a hamburger, fries, and a milk shake. While I was busy eating my dinner and chatting with the waitress, Susan was up on the roof of the building where DJ Ron Moore was spinning 45 records of the latest rock 'n' roll. In the summer he would let a few girls dance on the roof and my sister was one of them. She was slim, five foot five inches tall, with long blond hair worn in a flip, and she had great legs. I remember watching my sister do the Mashed Potatoes, the Twist, the Frug, The Shimmy, the Pony, the Cross Fire--all the latest dance moves. Jimmy Gilmer's Sugar Shack was one of Susan's favorite songs, along with Manfred Mann's, Doo Wah Diddy but her personal themes song was "Wake up Little Suzie" by the Everley Brothers. My favorite song at the tender age of five or six was Navy Blue sung by Diane Renay. I was fortunate to listen to some of the best music ever, broadcast live above my head on the Coke Show. 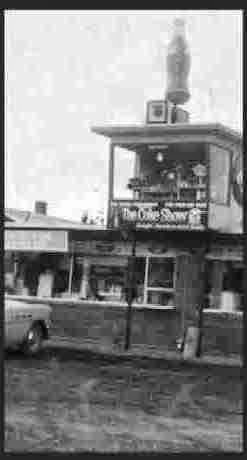 The Bun Drive in was THE happening place to hang out if you were a teenager in Anchorage in the 1960's. If you were a lucky little sister sometimes you got to tag along. 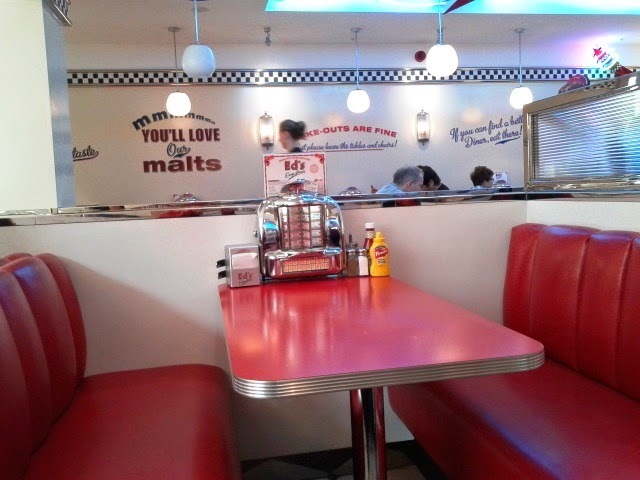 It was a real treat to sit on the pink leather stools that spun around, surrounded by the circular Formica counter. The fry chefs wore little paper hats and long white aprons and your meal arrived in a red plastic basket. The car hops wore red pants and white shirts with red lipstick with their hair in a pony tail. The burgers were all beef patties on large sesame seed buns. Crisp lettuce, slices of raw onion, and slivers of dill pickle nestled to the side of your burger. The bright yellow cheese square melted over the the top of the beef patty and the fries were freshly cut and deep fried to a golden crispness. The soda came in glasses with ice and two straws. The milk shake was made with local hard packed ice cream and real chocolate. Ed's Easy Diner brought all this back quite poignantly. 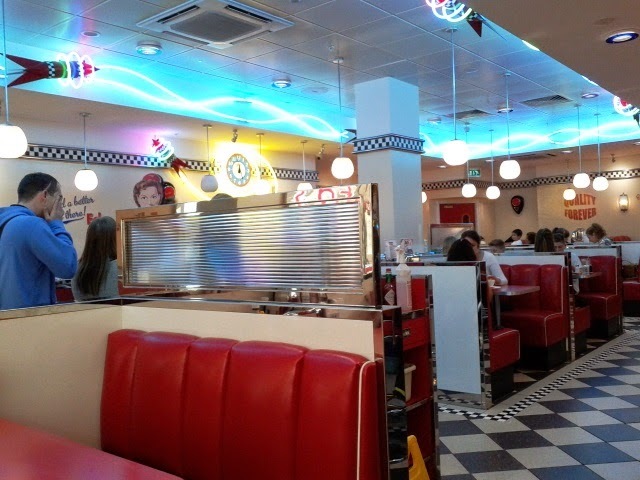 It is a true to life rendition of the classic American Burger Joint--from the decor, to the fry cooks with their paper hats; from the endless cups of coffee to the Juke boxes with classic rock 'n' roll playing. Then of course there's the food! Everything on the menu at Ed's is authentic American--no "near guesses" or strange British approximations. The hot dogs are REAL hot dogs--100% meat, no rusk, wheat stabilizers, or bread of any kind except the buns themselves. And they have authentic A&W Root Beer!!! Which takes me back to the few times a year our mom would take us across town to the A&W Drive In. We would park out front and the car hop took our order and brought it out to the car. Consequently I have no memory at all of the interior of the building. We sat in our car because the original Anchorage A&W had of all things a live Lion in a cage! Looking back now I feel terrible for its incarceration as a thing of curiosity in a northern climate totally unsuited to its species. Back then though, it was an amazing site to see while drinking a frothy A&W Root Beer float. The food at Ed's Easy Diner is not cheap but it is well worth visiting as an occasional treat. And I promise--you haven't lived until you have had an A&W Root Beer float! A bit of medical, shopping, smoking and followers. A few things to blog about but first the most important one that has given us a little more freedom to roam. Just this week I attended the Urology clinic for my post surgery check. For the last 28 days I have had a catheter draining into a leg bag that together with the stoma bag gave me the nickname `Bag Man`. This clinic appointment was to remove the catheter, yippee, and teach me the art of intermittent self-catheterisation. I won`t provide a link but must point out my need to do this is not to drain the bladder but to dilate the urethra that was enlarged in the surgery. All H2O systems are functioning 100% and likewise I feel 100% fit. Men, if this makes your eyes water, believe me it`s easy and painless. I need to do this daily at first then less and less until it becomes fortnightly. Beats more surgery or back to the bag. So now we can cruise away from Watford as the next medical appointment is June 9th to see the surgeon about a reversal of the stoma; a bus trip is preferable to staying in the same area. Mind you we are not holding our breath as this has been cancelled twice already. I do love shopping with Jaq. She makes her list on-line, selects her delivery slot, place and time. We don`t need a bus and I do not need to traipse up and down the aisles of the Supermarket. We got down to the water point at the start of our one hour delivery slot and just 40 minutes later just as the water tank finished filling, along came Mr. Tesco`s van. Its so convenient that the access to the lock cottage was here. Jaq opened the side hatch and many bags entered directly into the galley. Next on the list is the third anniversary of me giving up smoking. I always said I smoked because I enjoyed it and gave it up without any aids other than a twiddler that occupied my hands when the urge arose. It was when Jaq came over for three weeks before we both returned to the U.S. to get married. The night before I put my tobacco on the shelf next my chair and it eventually got thrown out months later. If you need to test your resolve just leave temptation close by. We currently have 108 registered blog followers. Thank you all. Many often pass and shout out "we read your blog" when we are not prepared to write down the names of their boats. Today was different, as I was waiting for the Tesco man to call. I had the camera in hand,and the crew aboard Voyager have the honor of representing all the followers who have passed by over the years. Two other followers passed by in the last week shouting `we read your blog.` One was Etoile du Nord and another slipped by too quickly but Jaq believes it had a Welsh name. So if you recently passed through the Cassiobury Park area then a big hi! to you both. Electric cars are getting more popular but the thing holding them back seems to be price and range the latter then leads to access of charging points. Imagine if every car entering London had to be electric and it was the same number that enter today. Like in the picture (left) not just every on street space would need a charge point but every car park be it office or public sites. At present electric cars don`t pay the congestion charge so if all the cars became electric I wonder what the new charge would be called, perhaps `entry charge`. For sure the money would still be generated some way or another. Source London has 1400 charge points in London and the outer suburbs with more planned. The site states £10 fee per year with no extra charge for charging vehicles. This is a G Wiz electric car I photographed in central London. They date back to about 2005 when the cost new was about £7000 ($11400). A car of similar age (2006) would cost £3000 ($4890) complete with new set of batteries. 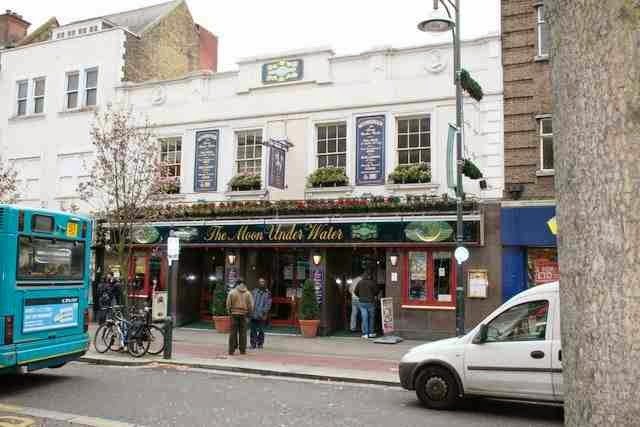 The above site `cost new link` states free parking in London for electrics, that was 2005 so not sure about 2014. A bit more comfort in the electric Nissan Leaf. £16,490 ($26,870) plus you have a battery rental to pay which varies according to contract length. £21,490 ($35k) gives you ownership of car and batteries. These prices include taxes and a UK government grant of £5k-$8k. So without the grant an expensive car. Interesting article here but remember when reading the bit about double cost of an equivalent car he is testing a top of the range Leaf. A Ford focus studio is priced at £14k ($22.8k) so about £12k price difference. Remember that £21.490 price above is after the £5k grant. I know some might say I have to much time on my hands and it`s true. Us old folk call it retirement. So with all this time I have worked out a plan. Lease a mid range Nissan Leaf Acenta. 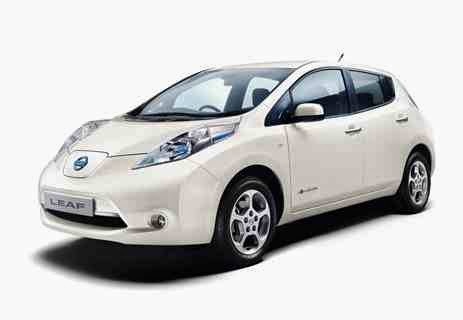 Cost £200 per month includes battery hire based on 6,000 miles per annum. Say you drive in to London from 60 miles out. The 120 daily mileage is allowing for holidays within the 6,000 miles per annum. The train ticket is £5132 (I used Northampton to Euston). Now perhaps you travel across the capital so there are extra costs, perhaps £4 per day, £960 per annum. The car parking and battery recharge is free in London. The 4year car contract involves a deposit so I have factored in this cost in the yearly cost. Of course if you bought the used G-Wiz at the top of page for £3000 you would need only run it 6 months to get your money back. I know car insurance and some maintenance(for non diy folk) needs adding but the train fares do increase by a fair bit each year and train delays and cancellations are beyond the control of commuters. If you really want to cut your commuting costs the Renault Twizy -where do they get these names- can be yours for about £7,000 ($11400). I think folding doors came to £500 plus the battery hire was £55. You do your own research but not bad just as a 50mph commute car. 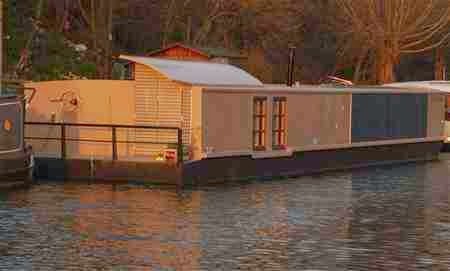 The Bauhaus Barge is all electric and in 2011 was for sale at £120.000 ($195k). It has a 1.2 ton battery bank. It is currently moored on the Paddington arm at Kensal Green. 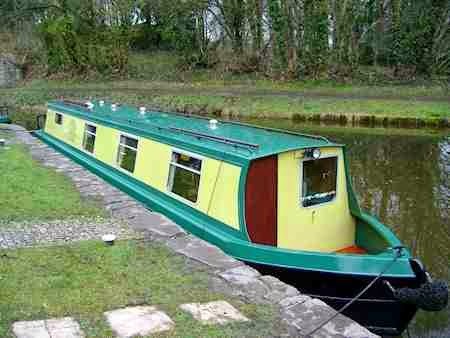 This narrowboat, Brecon Castle, appears to be your average hire boat but the big difference is it`s all electric. One of a pair owned and run by Castle Narrowboats they are the only all electric boats for hire on the canal system. They are on the Monmouthshire and Brecon canal in Wales a 33 mile section isolated from the main canal system. There are six charge points which for two boats seems reasonable although if both boats head down to Pontypool (map) together the one charge point could be a problem. In August, pretty much high season, a four berth boat will cost £1239 that`s about $2019 per week depending on exchange rates. The diesel powered boats in the fleet have the same hire price. The Electric Barge/Floating classroom came into Paddington while we were there. Costing $10,500 (£6,400) the Solar powered personal boat can ferry up to four adults. The boat is powered by a 700W electric motor that enables the boat to move silently at 5mph. The motor is powered by four deep cycle batteries that are constantly recharged by the sun during daylight hours. The batteries hold a reserve charge that can power the boat for 6 hours after dark. Impulse a narrowboat powered solely by the suns rays. Picture from the site. Canal River Trust give a 25% discount on the canal boat licence for electrically powered boats. Can you imagine all boats being electric and the hole in CRT finances as 35,000 boats claim a 25% discount. Like the congestion charge this drop in income would need to be raised in other ways. Another consideration would be the number of charge points needed. Ok that 35,000 figure is not the boats cruising the waterways as most will be sitting in marinas. Not sure of the number of boats along the towpaths, and lets not get into the continuous cruiser debate, but whether or not they move they still need power. Remember all electric, no diesel engines. 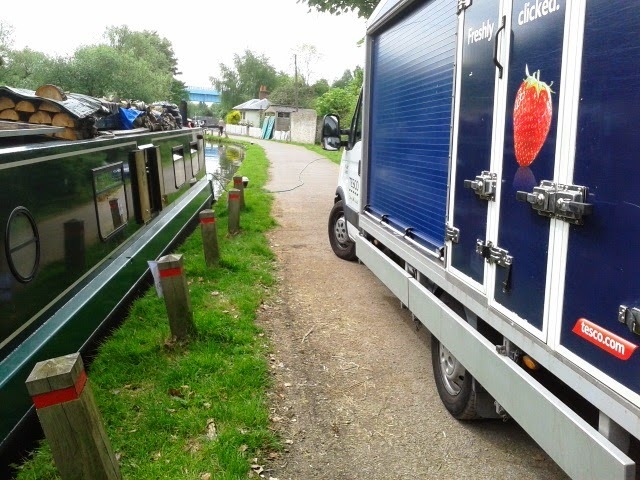 If the number was 4,000 we would need a charging point every half mile along our 2,000 miles of CaRT waterways. What happens in the main season when all those extra boats exit marinas to cruise the system? With a lot of boats using solar panels the summer would mean a lot of vacant charging points but still a lot of boats seeking a charge point in the honeypot areas. All the above came from that top of page picture of the G Wiz I snapped in London for no other reason than it was something not seen on every street. 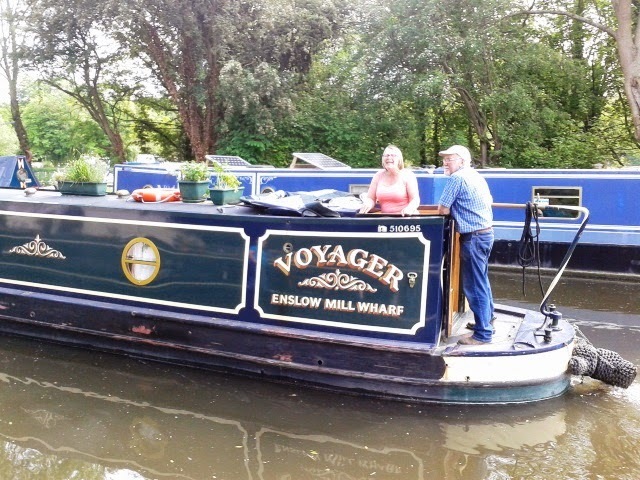 Perhaps electric power has a long way to go but it was fun to sit researching this on a quiet canal side mooring with solar powering my laptop and all the boats electrical needs. I do so love our life afloat. U.S. readers might find this one interesting. 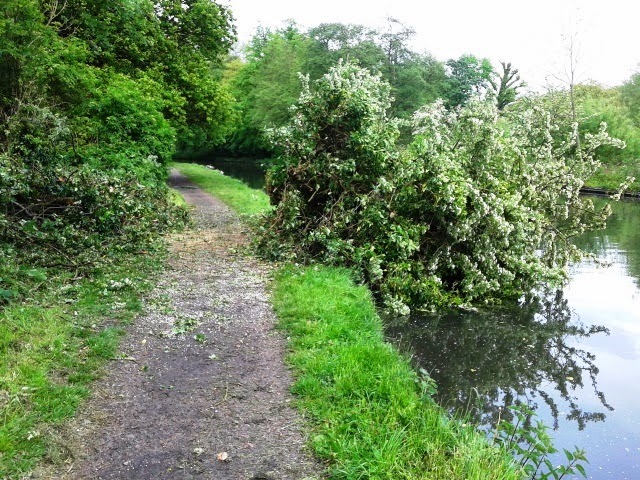 The tree has been cleared from the towpath but Canal and River Trust don`t seem to know who has done the work. 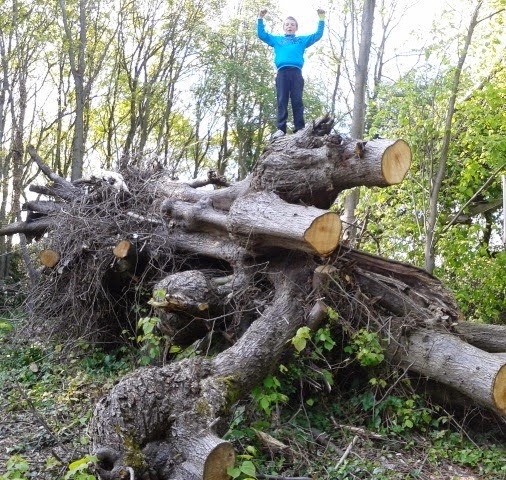 Their reply to my e mail states "the local supervisor and contracts manager have not instructed the works to be carried out as they had no knowledge of the tree being down". It goes on to say perhaps Dacorum council have completed the works, trouble is the site is in Watford councils area. All very weird as I phoned the number on the CRT website. Anyway as I have said the area is now clear. did he get them from? LumberJack watched by Jaq. Oh I see. I only dozed for ten minutes so be warned watch those grandchildren. 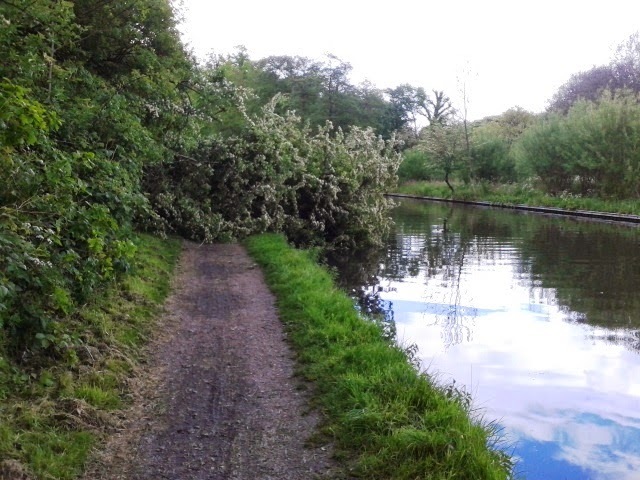 Trees come down all the time along our canals which for us log burning liveaboards is a good source of fuel. High winds and trees leaning in a dangerous manner are reasons for trees to end up horizontal but this one was just a victim of rot and an overbearing weight from the Ivy using it as a climbing pole. Now the only number I had to hand was the emergency one 0800 4799947, it rang and rang and rang. 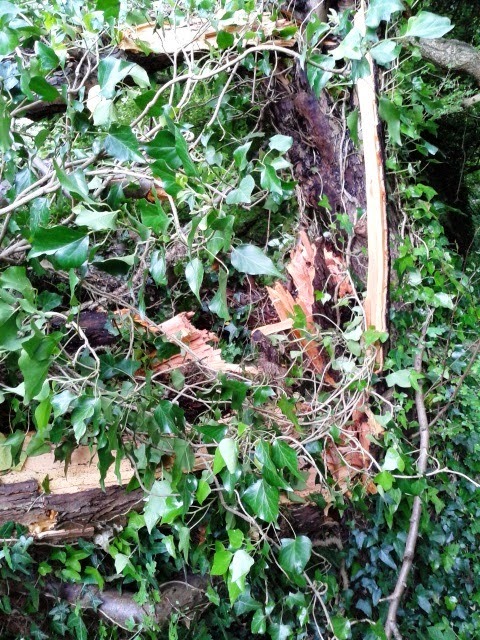 Jaq found a number online that was answered quickly and within 2 hours contractors appeared and began removing the tree. Fifty minutes later they departed and you can see in the second picture below a huge part is just about on the towpath. Milton Keynes office are responsible for this section so they now have before and after pictures. It will be interesting to hear what they say. Health and Safety will probably be the answer. The wash from a fast passing boat will probably drag the remaining foliage into the canal. It came down this morning on a windless day. No warning. Two days ago there were three boats moored along here. Mentioning the so called free phone (toll free) 0800 number has reminded me of something. As you know here in the UK if we use a mobile(cell) to call these type of number it costs dearly but is free from a landline. We all have inclusive minutes in our plans that allow calls to any landline or mobile phone but not the dreaded 0800 plus a couple of others. 0800 Buster is the way to call these numbers by just using your inclusive minutes, so basically no out of plan charges. Save the number on your mobile and dial it when you need to call a 0800, 0808 or 0500 number. When you dial the number you’ll be prompted to tap in the freephone number you want to call followed by the hash (#) sign. Do this and you’ll only be charged for a UK landline number which will be free if you have inclusive minutes. Similar to our account we use to call the U.S. at a penny per minute. I have mentioned Stockers Lock in the past but have looked more at the history recently so here it gets a second mention. This is Stockers lock and the house, built for the collector of coal duties entering London by canal. The Great Fire of London in 1666 brought about a duty imposed by the Corporation of London on coal entering the capital. The duties were to finance the re-building of St. Paul's Cathedral, other London churches and public buildings plus Newgate prison. Of course the canal wasn`t around then and coal--known as `seacoal` came into London by ship. The duty in 1667 was a shilling per chaldron. A chaldron was not a weight but a measurement used for coal (try a Google search). Its size varied from district to district because this helped merchants save duties; but from what I`ve read was about 25cwt or one and a quarter tons. So for our U.S. readers and those born post decimal, the duty was 5 pence (8 cents) per ton and a quarter (1524kilos). Looking up that kilo conversion I found long, short, and metric tons. I used the former. I am well confused here as my childhood school days taught me 112 lbs. = 1cwt. and 20cwt.= 1 ton or 2240lbs. I think my confusion is to do with long and short tons, and just like the blog post I did from the states on the cost of petrol and I got it wrong, this could all end up the same way. Now if I had married an English girl the last few lines wouldn't have been needed but as love wins over everything you can just work it out for yourselves. Anyway back to the story of the coal duties. The 1667 act also allowed for the building of the `The London Monument` commemorating the Great Fire of London. In 1670 the duty tripled. The area affected by the duty stretched out to a radius of about 25 miles and included coal entering the London limits by any means. 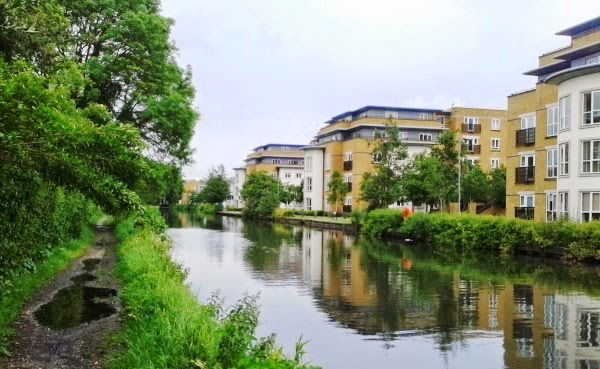 In 1793 the act of Parliament for the Grand Junction canal included the restriction, following protests by sea companies, that coal would not be brought closer to London than Langlebury just north of Watford. 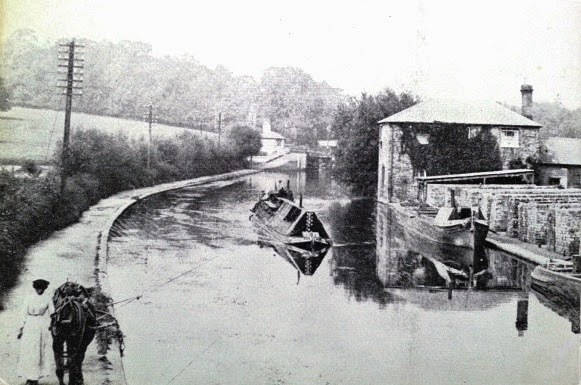 Langlebury was to be the route of the canal to avoid the Grove and Cassiobury parks owned by the Earls of Clarendon and Essex who were none too keen on allowing the canal through their property. Money changed hands and the canal route also changed--back to the canal company's' preferred route through the parks. 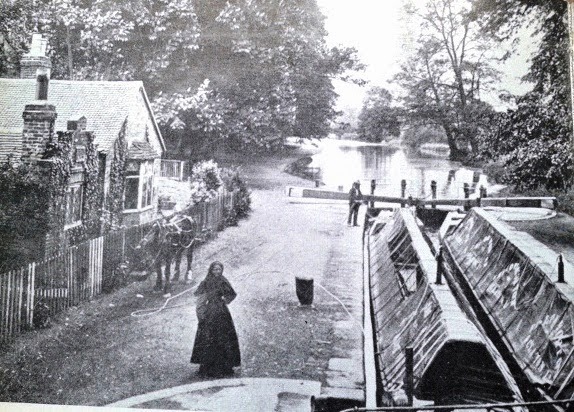 Lady Capel's Wharf within Grove Park became a busy depot as coal was unloaded onto carts for delivery in the area. In years to come the railway company were refused the same access across the parks and Cashio tunnel led the rails into Watford. I guess the name Cassio as in lock and bridge came from Cashio. Parliamentry acts from 1805 and later allowed for 50,000 tons of coal to enter London subject to the duties being paid. The railway companies were allowed 500 tons duty free for use in their locomotives in the London area. In 1861 the boundry for the coal duty changed to the Metropolitan Police district and Stockers house was built just a few hundred yards inside the boundary for the collector of the coal duties coming in by canal. The boundary was marked by stone or cast iron posts as in the one at Stockers lock, pictured at right. In 1869 so little coal was actually entering London due to railway competition, the canal companies made their own payments and Stockers house was sold. Duties were paid weekly by the rail companies and monthly by canal carriers. The coal duty collector for the Corporation of London finished his time at Bushey, a busy rail link to London, and in 1889 coal duties stopped. An approximate map showing the Coal duty boundary. and Stockers lake owned by Veoila water. 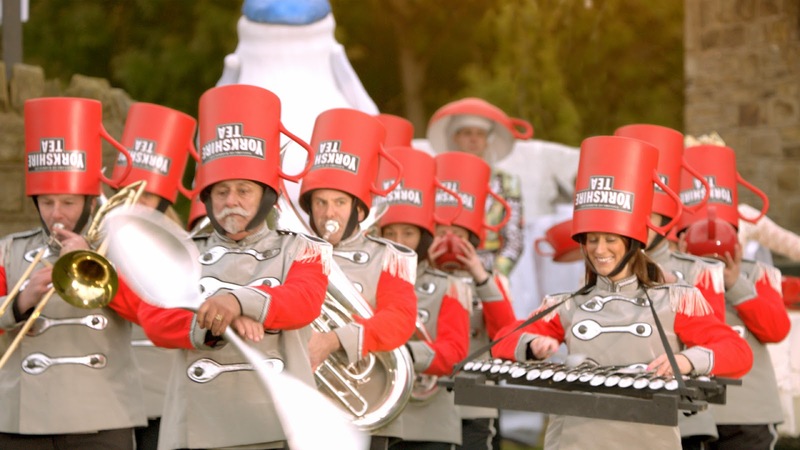 Veoila Water is a French company supplying fresh water to households throughout the UK. How the bloody useless government could allow other countries to control our utilities including gas and electric supplies is beyond me. OK deep breathing Les, you live on the peaceful canal system, that world is far enough away.....breath the fresh air in-out in-out....ok i`m fine just nearly slipped back eight or so years into the stresses of living in a house and having all those big utility bills. No all is fine I can see Jaq and it`s all becoming clearer......the blog. Here we go, phew! that was close, the lakes were originally gravel quarries and some of the gravel was used in 1923 to build the original Wembley Stadium. Rickmansworth Water Ski club use batchworth lake that is just under a mile around it`s edge. Jaq laughed when the skier came past as it seemed he might come to grief on such a small area of water. Jaq says Big Lake in Alaska, a childhood camping site had water skiing and it was 12.9 miles across and 67 miles around the edge. That she says is a lake, Batchworth is a pond. 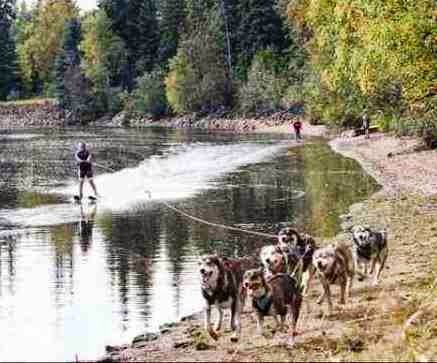 Jaq dug out this picture of a six Husky dog team taking the place of the speedboat. A walk around the lakes is a fairly safe past time but beware of the dragons lurking in the grass. 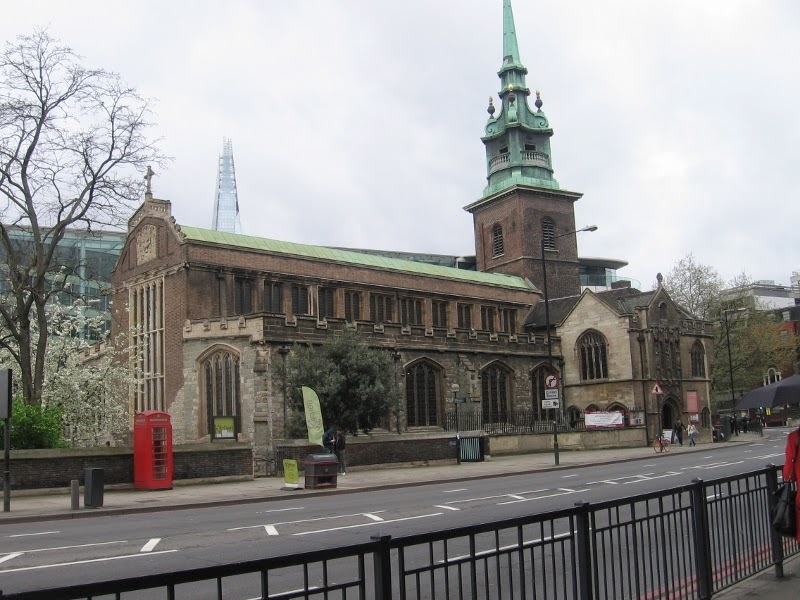 London 2014: All Hallows by the Tower; The Oldest Church in Londan has Links to America! WARNING: HISTORY AHEAD!! A LONG NARROW DIP INTO 19 CENTURIES OF A TINY SQUARE BIT OF LAND NEAR THE THAMES. MAKE YOUR TEA, GRAB A BISCUIT, AND SETTLE IN OR...VISIT SOMEONE ELSE'S BLOG IF YOU DON'T FANCY A RIDE BACK IN TIME. I've never seen so many churches in my life than in this "green and pleasant land." The face of this country is covered by small village churches and great cathedrals, with thousands of years of Christian prayer, will and determination virtually holding them together in some cases. 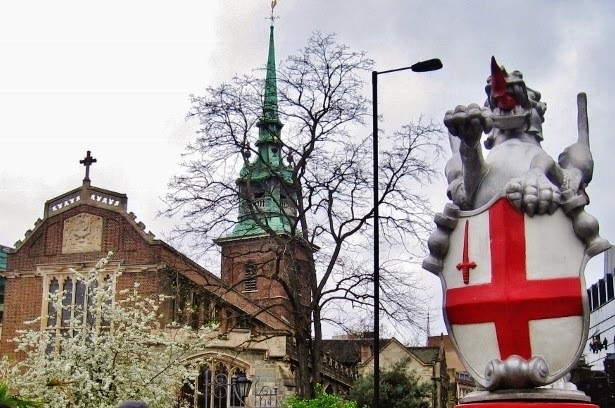 By 1643 there were one hundred churches of note in the one square mile which makes up the official City of London as bounded by the River Thames and the old Roman walls. While I am not a Christian, I find the history enclosed in British churches a moving testimony to the greater society in which they were and are still anchored. Oft times I am completely taken aback at the connections I find inside these ancient houses of worship. The Tower of London is off to the left out of sight. All Hallows by the Tower called to me as we visited the adjacent Tower of London. I could hear the voices of centuries whispering--beckoning to me--over the modern din of thousands of tourists milling on Tower Hill waiting for buses, snapping pictures, eating lunches, and buying tickets to see the Yeoman Warders and the Royal Jewels. I felt the inexorable pull of All Hallows church standing tall in the face of modern encroachment: a Kitchen Tower restaurant stands on the premises of the old churchyard, its cranked stereo spewing out loud music which would indeed wake the dead had they not been disinterred to make space for yet another commercial concern. A sign for KFC stands out in vulgar relief against the bricks of the churchyard wall. Tower Place West rises above and behind All Hallows church, a ghastly glass tribute to Mammon reaching outward toward the chapel, ready to gobble it up for some enormous sum I'm sure. 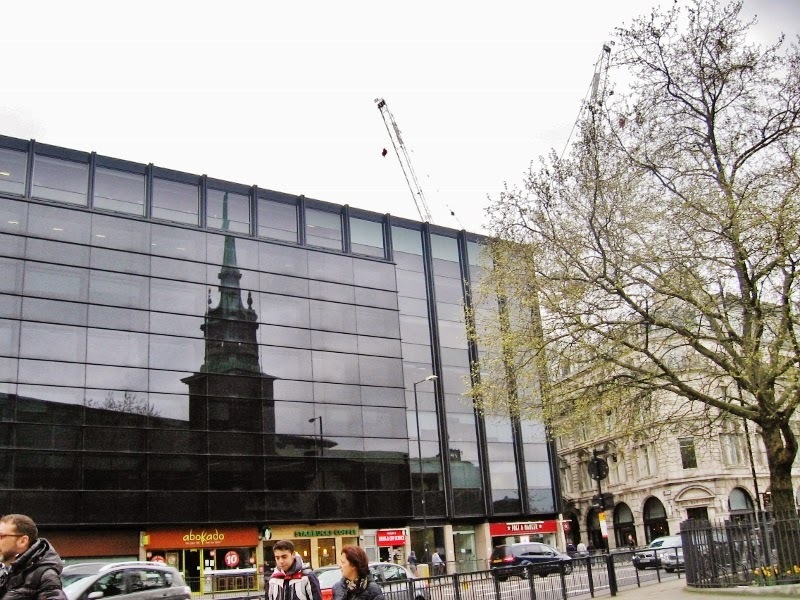 I wanted to capture a striking picture of All Hallows church tower reflected in the modern glass building across the street from the church. As I walked away from All Hallows, toward the clear glass canopy of Tower place in order to gain a wider perspective for my camera, two foreign security guards warned me off with hand signs. I attempted to explain I wanted to stand just under the canopy to photograph the church and I was basically warned to get out with vigorous head shakes and shooing motions of their hands and arms as they began to march toward me, their unfriendly grimaces ensuring they meant business. All Hallows has withstood the ravages of time and the tidal Thames; it survived direct bombing in WWII. Will it survive another millennium without further bits being carved away for corporate greed? I sincerely hope so. From this tower local man and diarist Samuel Pepys watched in horror as the Great Fire Of London on September 1st, 1666 raced down Tower street consuming everything in tis pat. of it he wrote, "I up to the top of Barking steeple and there saw the saddest site of desolation I ever saw. Everywhere great fires, the fire spread as far as I could see it." All Hallows by the Tower with one of the famed Dragons which guard entry to the one square mile City of London. 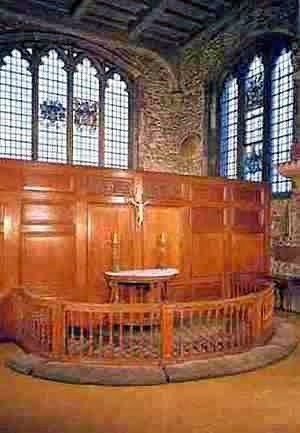 There has been a Christian community at All Hallows for 1339 years. It is located at the far southeastern edge of boundaries of the City of London, guarded from without by one of London's famous Dragons. This church literally embodies nineteen centuries of architecture, having been built on the foundations of an older Roman building--the remains of a tessellated mosaic floor from a house which once stood on the spot--may be seen in the under croft. 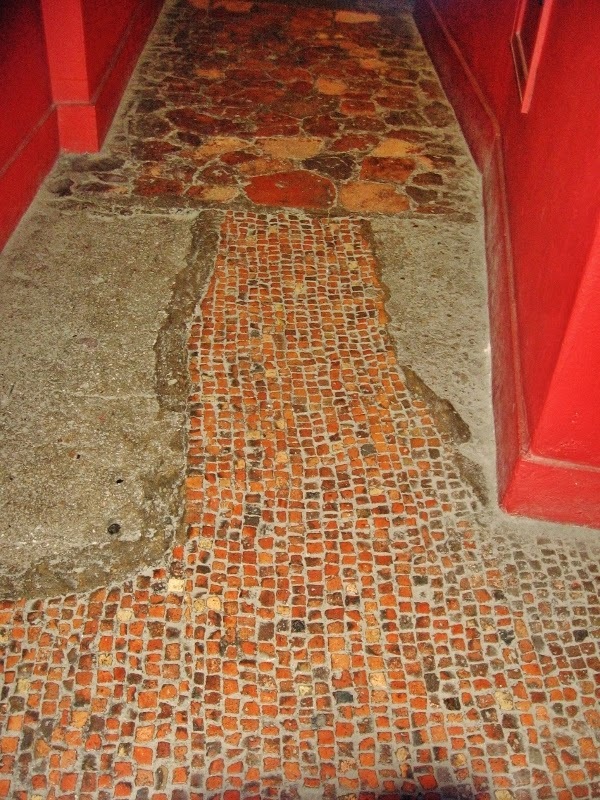 I have walked on the very same tiles as were trod by Roman sandled feet. It is an eerie feeling, standing on the floor of a Roman home from 90 AD. If only those tiles could talk! There exists as well a carved arch from the Saxon church which predated the current one by a thousand years or more. It supported the walls of a sanctuary here in the 6th century and was eventually enclosed in the walls of All Hallows, only to be uncovered in 1940 by a bomb blast which destroyed the medieval church walls. 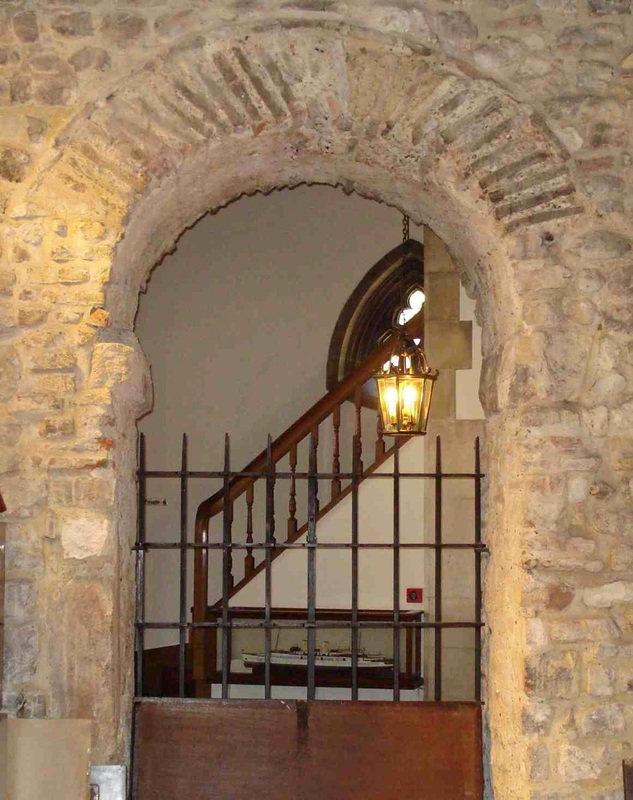 This is THE oldest known surviving Saxon arch in London which bears testament to the foundations of All Hallows in 675 AD. It stands in the west end of the nave.The top of the arch is made from Roman roof tiles recycled by the Saxons. 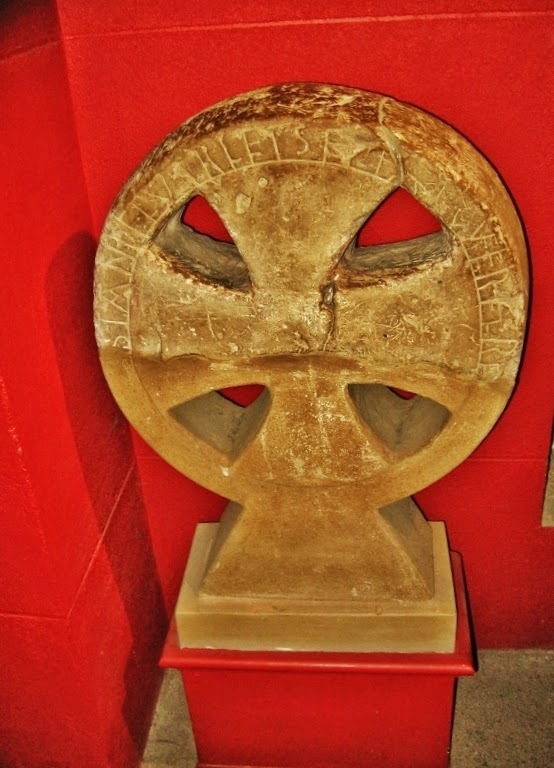 The upper piece of a large wheeled stone cross was found under the nave of the church in 1951 when rebuilding commenced after the bomb damage in WWII. This burial stone is dated to 900 AD and is inscribed in Anglo-Saxon, "Thelvar had this stone set up over here..."
The Croke Altar carved of Purbeck marble as a tomb for London Alderman John Croke (1477) is an amazing artifact. Destroyed by a direct bomb hit in WWII, his tomb was painstakingly restored from 1500 fragments. This marble altar records the effigies of the Alderman, his eight sons, his wife Margaret, and his five daughters. Inside this amazingly humble and modest community church is a series of paintings on four panels of a winged triptych from the 1500's by a Flemish painter, featuring various saints of the church and Sir Robert Tate kneeling for baptism by Jesus' cousin John. Sir John is of the family concern from which the Tate and Lyle Sugar company has sprung. There are brasses from the 1500's embedded in the floor of the nave picturing Jesus' resurrection and effigies of parishioner Andrew Evyngar and his wife Ellen, given as a reminder to say mass for their souls. Puritans under Cromwell in the mid 1640's defiled the face and removed some of the words. The Southern aisle of All Hallows is home to a Mariner's chapel with stained glass windows depicting the coat of arms of various shipping companies devoted to the church. The Port of London Authority also has links to this site in the form of a lovely wooden screen. The crucifix upon which an ivory carved Jesus hangs was created of wood from the Cutty Sark; the ivory for Christ's effigy is said to have come from the Captain's cabin of the flagship of the Spanish Armada. 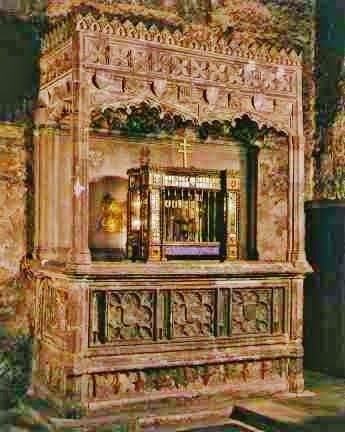 There are also several other parochial items of interests such as a lectern with pieces form the original medieval church, a baptismal font cover carved by Grinling Gibbons, and various pieces of gilt communion plate from the 16th century. After a thorough poke about on the main floor of this church the best is yet to come in my opinion, for hidden beneath the nave is the under croft of the Saxon church, parts of which date back to the second through 14th centuries. It contains three chapels: The Columbarium, and the chapels of St. Francis of Assisi and that of St. Clare. 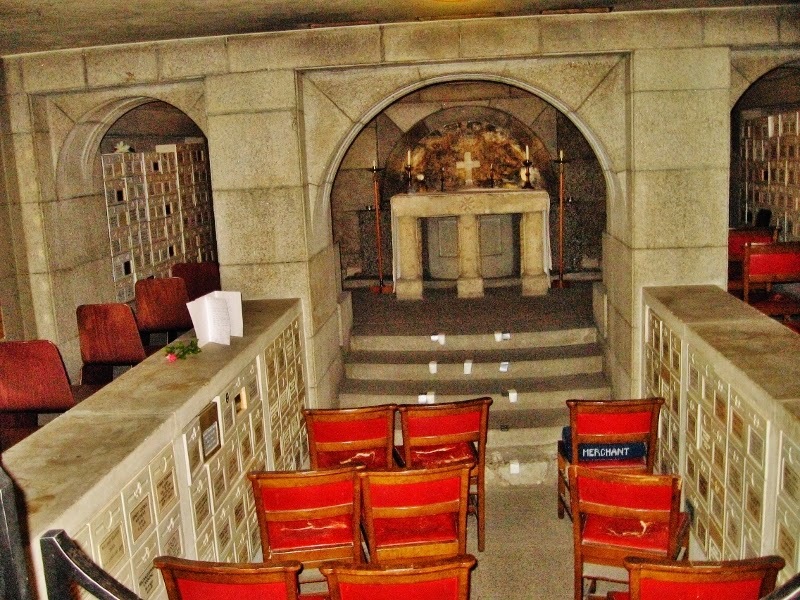 The Columbarium is a place of internment for the ashes of parishioners and those closely connected to All Hallows by the Tower. This section previously was outside the walls of the current building, and was once part of the burial ground of the Saxon church. There are three Saxon coffins within, all buried before the arrival of the Normans in 1066. In place below the present day altar are stone thought to have once from the alter of the chapel of Richard Couer de Lion (Richard the Lion Heart) aka Richard I, third son of King Henry II and Eleanor of Aquitaine. He spent years in the East on Crusade and would have been acquainted with the Knights Templar's--described as rough knights in the battlefield and pious monks at chapel. 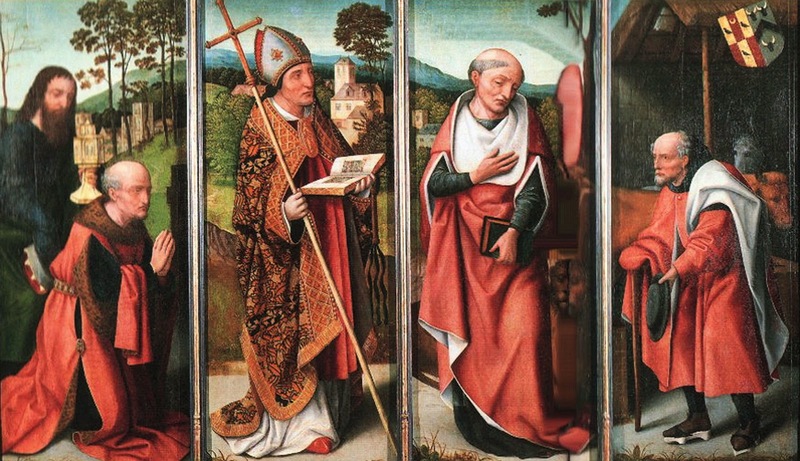 These men swore on the cross an oath of poverty, chastity, and devotion to the Catholic church with the charge of protecting the Christian kingdom. Theirs was the job of protecting citizens on pilgrimage to the Holy Land, from robbers, marauders, and captivity by local Muslim tribes and anyone else seeking to interfere with pilgrimage. They built marvelous defensive castles, the remains of which can still be seen today. Despite living only on alms at first, the Knights Templar combined two great male passions of the Middle Ages: religious fervor and martial prowess. Their ranks quickly swelled from eight to four hundred, as the Crusades grew in number from one to eight, over a period from 1118-1270. Favorite sons of the Church, The Templars' properties were exempt from taxation and ecclesiastical tithes. The Order answered only to the Pope. Over time the Templar's became incredibly wealthy as members brought their wealth and real estate to the order. The Templar's kept their money in temples located in London and Paris. Their treasure was inviting to Kings and leaders who wanted it to fund wars and further crusades, and the Order went into the word-of-mouth business of making loans to kings and principalities sewing the seed of their destruction. Eventually the Crusades failed to hang on to the Outremer as the Christian States of the far east were known. These included the County of Odessa, the Principality of Antioch, The county of Tripoli and the Kingdom of Jerusalem. Without lands and pilgrims to protect, the Knights Templar were seen by some powerful bishops within the Church and various princes and Kings as a plum ripe for picking. Colluding with the pope, Phillip the Fair of France set out defame the Order and destroy it, spreading lascivious rumors about satanic rituals conducted by the Templar's. Knights were arrested all across France on October 13, 1307 and held in Phillips dungeon for inquisition. Phillip made it known this was done under the auspices of an ecclesiastical commission but in reality the Pope was unaware of what had taken place. Due to the cruel savagery of torture used to gain submission, nearly all the knights agreed to the accusations in an attempt to stay alive. Instead, they were burned at the stake. A hiding place for Templar Knights! Three were saved from this fate including the Head of the Order Jacques de Molay. The pope intervened and had them secreted away to England for another trial, which eventually ended in death. And thus we come to why I've included this bit of history. These Knights were hidden away for the second inquisition, in the chapel of St. Mary--within the under croft of All Hallows by the Tower. The Crows Nest from Sir Ernest Shackleton's ship Quest. One of the many amazing artifacts on display in the crypt museum of All Hallows Church by the Tower. 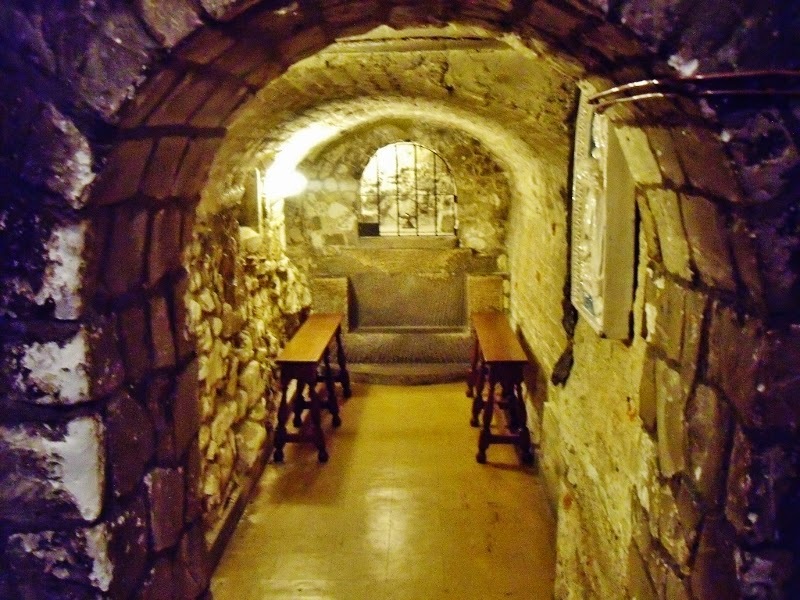 While these spaces are worthy of visiting, the crypt of All Hallows is a definite must see as it contains a museum with artifacts from Roman occupation through the 1940's and WWII. It was here that I found amazing connections to America!! William Penn Jr., the founder of the State of Pennsylvania was baptized at All Hallows by the Tower on the 23rd of October 1644. 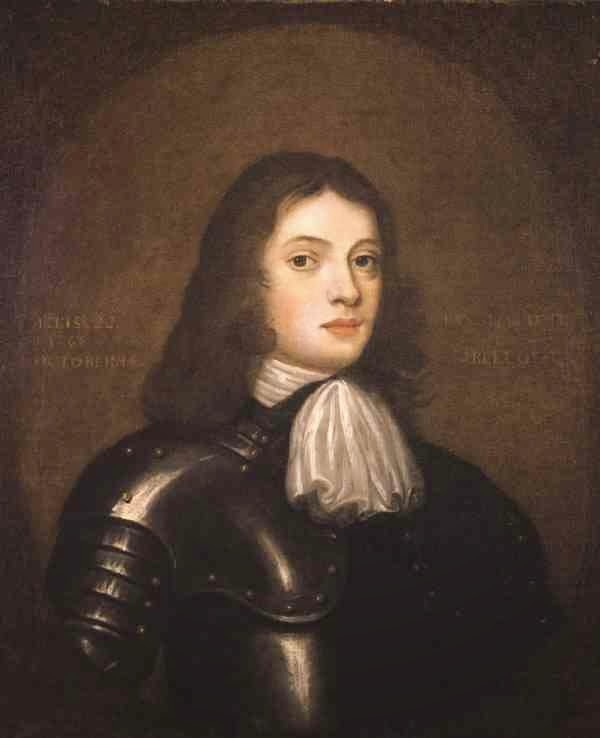 His father, Sir William Penn was an Admiral in the Royal Navy and a Member of Parliament in the House of Commons during the English Civil Wars. He made much of his wealth applying for land grants on properties confiscated from Irish Catholics and Royalist supporters after he took part in putting down the failed Irish Rebellion of 1641. Meanwhile Penn Senior stayed discreetly in touch with Royalist supporters abroad, playing both sides to his own benefit. As a moderate Puritan, Penn managed to survive quite well during the Cromwell Protectorate. When it ended and the monarchy was reestablished with limited powers, William Penn Senior was on the ship which fetched King Charles II back to England. While sailing over to France Penn Senior ingratiated himself with the Duke of York--soon to be awarded the title of Lord high Admiral. With this fortuitous bit of networking in hand William Penn Sr. was appointed Commissioner of the Navy Board where he worked with none other than Mr. Samuel Pepys, diarist, and who was also Penn's next door neighbor. Pepys took a dim view of William Penn, senior, saying, "To the office, where the falsenesse and impertinencies of Sir W. Pen would make a man mad to think of." (Pepys diary, 5th April, 1666). Of course it is also possible Pepys threw such a jaundiced eye upon his neighbor because he tried--unsuccessfully--to seduce both William's wife Margaret and his daughter Peggy! William Penn the elder is credited with saving the Easternmost part of the city during the Great Fire of 1666 when ordered the houses along street in front of All Hallows to be blasted with dynamite to serve as a firebreak which saved the church. No. 23: "William sonn of William Penn and Margaret his wife of the Tower Liberties." Baptized 23, October 1644. As his friendship with Charles II grew, Admiral Sir William Penn loaned the king £16,000.00 which was to have a profound effect on his son's future. In the meantime, William Penn the younger grew up in good circumstances, though he eschewed following in his father's religious and other footsteps. Instead of following his father's Reformed Puritan beliefs, at the age of twenty two, young Penn chose to become a member of the The Society of Friends or Quakers. This led to a falling out with his father who threw young William out of his house. Typical youthful rebellion, yeah? 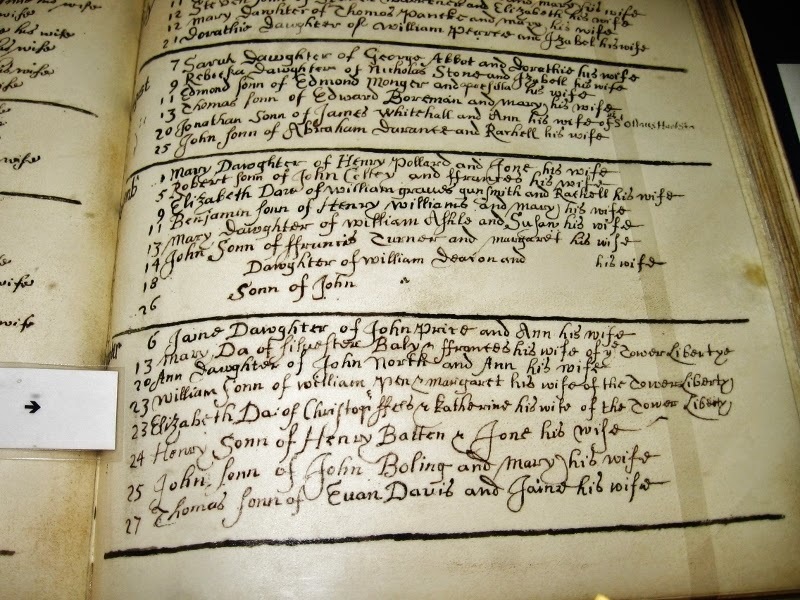 A man with a deep faith in his religious convictions, Penn Junior spent time in the Newgate Prison, the Old Bailey, and the Tower of London for writing pamphlets about this new religion inspired by his friend George Fox, one of Quakerism's founders. Thus began a time of personal tempering as William was arrested for preaching in the streets and taken first to the Old Bailey where the trail was heard by jurors who found Penn Junior not guilty despite being kept from food, fire or water for two days and nights--and for which all the jurors were then fined 40 marks and sent to Newgate prison! Penn meanwhile was arrested immediately again for wearing a hat in the presence of the court. He appealed to a court of common please which reversed the crooked finding of the lower court; thus was established the principle of English law that it is the right of the jury to judge the evidence independently of the dictation or direction of the court. In 1681 after his father's death, the matter of the King's debt arose. King Charles the Second granted millions of acres to Penn the Younger in the New World which the King named Pennsylvania. The now wealthy Penn and his Quaker followers settled and began building the capitol city of Philadelphia. William was a pacifist who held passionate beliefs regarding democracy and religious freedom. Many of the principles he engaged in the founding of Pennsylvania were later included in the United States Constitution. Over his lifetime William Penn Junior would become a widower, marry again, travel back and forth between England and America attempting to settle land boundary disputes between Pennsylvania and Maryland, which was owned by the Duke of Baltimore. Penn died in England a penniless man and was buried in a simple grave with no headstone. September 4th 1877 Quaker Oats became America's first registered cereal brand. According to the company "The 'Quaker man' is not an actual person. His image is that of a man dressed in the Quaker garb, chosen because the Quaker faith projected the values of honesty, integrity, purity and strength." However, early Quaker Oats advertising, dating back to 1909, did, indeed, identify the man as William Penn, "standard bearer of the Quakers and of Quaker Oats." 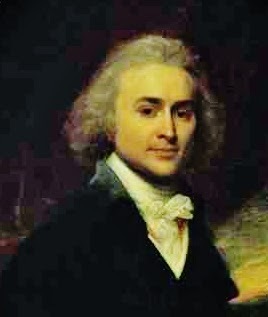 First born son of Abigail Smith Adams and John Adams--first U.S. Vice President and second President, John Quincy Adams began seventy years of public service at the age of eleven when he served as his father's secretary on a diplomatic mission to France. He spoke five languages including Greek and Latin and graduated with a degree in Law from Harvard University. This son of American Independence shaped the first century of U.S. foreign policy, and a devout Puritan; an inexorable adversary of slavery and a keen practitioner of law. He served by President George Washington as U.S. Minister to both Holland and Prussia. Resigning from congress in 1808 John Quincy was asked by America's fourth President James Madison to serve as minister to Russia. He went on to serve as the first post War of Independence minister to Britain. As his father before him, and his son Charles would do after him, John Quincy Adams stood proudly before the King of the former mother country as a representative of his independent nation. Tapped again for public service by fifth U.S. President James Monroe to serve as Secretary of State, he later ran for the highest office in the land. After serving for only one term as U.S. President, John--a once devoted Federalist (America's first political party founded to represent the interests of bankers and businessmen) who became embittered by partisan politics--retired to his books and his farm and changed his political persuasion to Whig (the second political party affiliated in the U.S. which stood against tyranny and for economic protectionism). Asked by his neighbors to serve them first in the Massachusetts House of Representatives and then in the U.S. House, John Quincy was elected to nine terms, earning his nickname "Old Man Eloquent." So what link could this son of the American Revolution possibly have to All Hallows? It is his wife Luisa Catherine Johnson, the only American First Lady born outside the United States. Daughter of an American merchant and an Englishwoman, her father served as U.S.Consul General in London after 1790, however during the War her family escaped London and took refuge in France. In Nantes four year old Luisa first met elven year old John Quincy when he traveled through with his father. They met again in London after the war and at age twenty two, Louisa married John Quincy Adams in All Hallows Church, July 26, 1797. 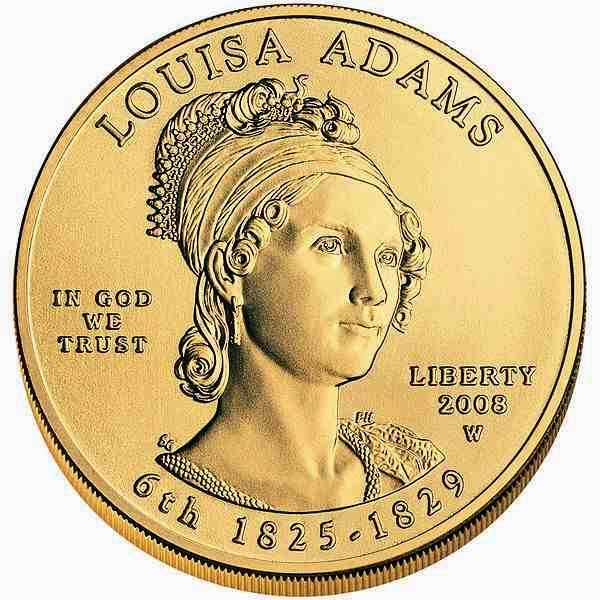 Louisa Adams $10 gold coin honoring the First Ladies of the U.S. Issued in 2008. United States Mint. John Quincy Adams "of Boston in the parish of America," and Luisa Catharine Johnson's signatures in the church registry. 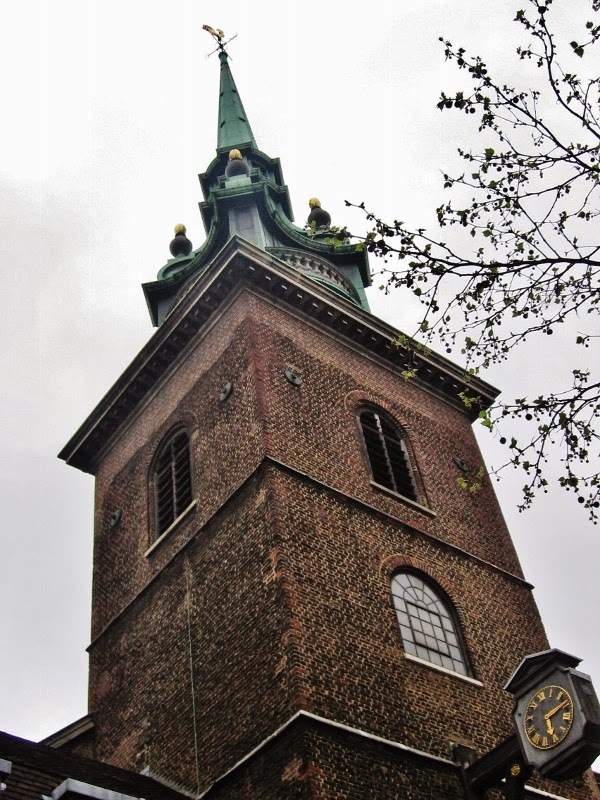 All Hallows by the Tower is also the home church for the parish which has administered local customs, rites, and ritual for more than six hundred years. During the more extreme measures of the Protestant Reformation many of the old church registers and documents were hidden...in a lead cistern in the tower of the church. Discovered in 1923, these documents reveal the only unbroken records of events on Tower Hill from the reign of Elizabeth the First (1558). Beating the Boundaries is an ancient medieval rite reaffirming the boundaries of a parish by proceeding around them to beat each boundary marker with wands while praying for protection and blessings for the land. The beating party for All Hallows by the Tower is made up of boys from St. Dunstans College Catford (Americans: a College over here is a secondary junior or senior high school) and the southern boundary of the parish is mid stream in the Thames! 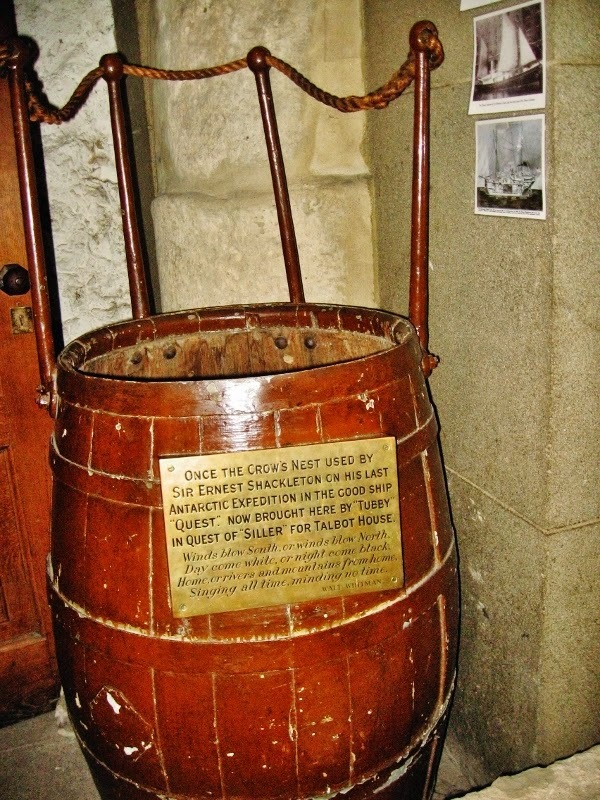 A boat conveys the beating party with the clergy and the Master of the associated Livery Companies (originally developed as guilds, livery companies were responsible for the regulation of their trades, controlling wages and labor conditions. Before the Protestant Reformation these guilds were closely associated with various churches, sponsoring mystery plays and participating in various religious observances. They are known for example as the Worshipful Company of Scriveners, Apothecaries, or Engineers) and a selected student is hoiked upside down by an ankle to beat the boundary in the middle of the Thames! Every third year this ceremony includes a mock battle with the Governor and Yeoman Warders of the Tower of London at the boundary mark shared by the Church and the Tower, commemorating a riot in 1698! this being the third year, the battle will take place on the terrace between the Church and the Tower at 7 p.m. May 29th. 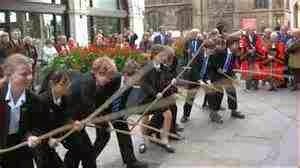 The Beating of the Bounds will occur at 3:15 p.m. Organized each year in June by the Company of Watermen and Lightermen of the River Thames (this Guild or Livery represents 500 years of tradition. Watermen carry passengers and Lightermen carry goods and cargo), on the appointed day each year one red rose is lucked from the garden on Seething Land, conveyed to Mansion House on the altar cushion from All Hallows and presented to the Lord Mayor of the City of London Corporation (this is not the Mayor of Greater London which is a political position and currently held by Boris Johnson). The Lord Mayor is an officiating presence representing, supporting and promoting the businesses and people of London--a business and cultural ambassador if you will. The present Lord Mayor is a the first ever woman to hold the post since records were kept beginning in 1189. 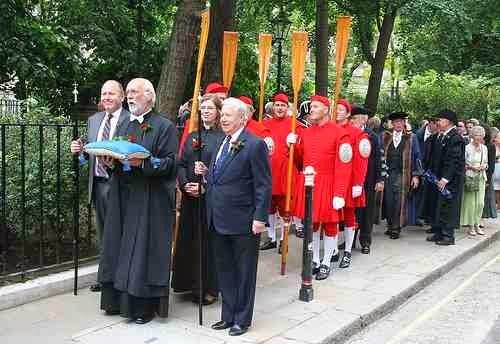 This Knollys Rose Ceremony commemorates an ancient judgment dating from 1381 in which a gentleman by the name of Sir Robert Knollys owned a house on Seething Lane. Sent abroad to fight in France with John of Gaunt (Prince of the realm), Knolly's wife bought up land across the street on which there was the City of London's threshing ground, where chaff was separated from grain. Mrs. Knollys did this because she was tired of the chaff blowing through her home and so she bought the threshing ground and put in a rose garden. she also put in a fourteen foot high footbridge over the lane to avoid walking in mud--all without planning permission. according to all the maps of London I have reviewed but the legal requirement lives on as a City tradition--a beloved spectacle. This year's ceremony takes place on Monday, June 23rd. If you are interested, you can gongoozle as the well heeled stand with pomp in a tiny side garden surrounded by folk in ancient ceremonial garb (one man wears a tri-corn hat and a furred vest) to pluck a rose and lay it upon a pillow after which it is marched up the street cordoned off by London Police while toffs in their finest followed by Watermen and Lightermen in medieval red suits wearing billed hats and carrying oars at attention, accompany the rose to a throne room with two red velvet thrones in front of which stands the Lord Mayor in tie and tails and his wife, waiting to receive the rent. No doubt afterward the gentry retire to a drawing room for claret and company and the local yokels head off the their favorite pub for a pint. There you have it! nineteen centuries or wild, wicked, glorious, sanctified history encompassed in one small square bit of Lady London! Whew!!! !